Search.freshtab.net is the PUP that uses misleading techniques to prevent removal. Use Reimage to locate malicious components and get rid of them faster than with uninstall instructions. A full system scan blocks virus reappearance and prevents traffic to malicious domains. Search.freshtab.net is a domain that may cause unwanted web browser's redirects to suspicious websites. According to cyber security experts, it features all traits typical to browser hijacker and potentially unwanted program (PUP). Usually, people install it accidentally without being aware of that, but it's not possible not to notice its presence. 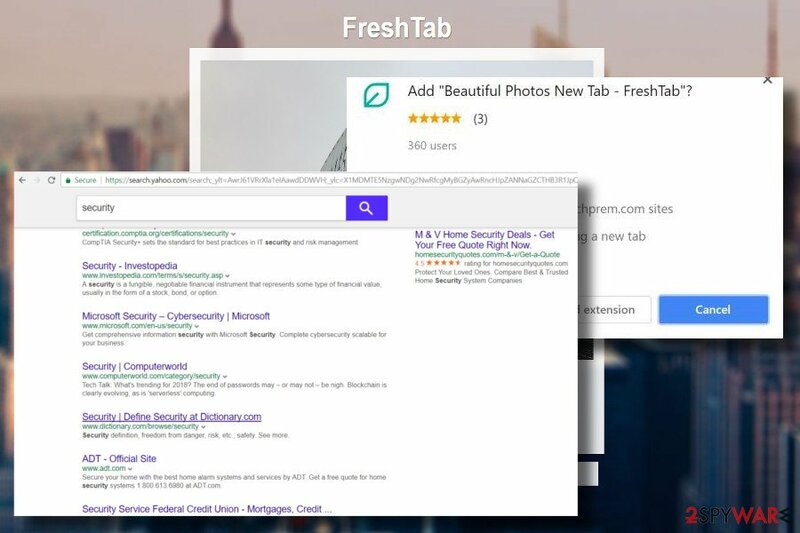 Once its extension is dropped on Chrome or another web browser, https://search.freshtab.net URL becomes a default start page and search provider. The purpose of Freshtab search is to increase traffic to affiliate websites. It renders Yahoo search results and tries to impersonate legitimate search site. Nevertheless, it may try to promote potentially dangerous web domains some of which may be used for malware distribution. By the way, freshtab virus may try gather personally non-identifiable information, including your web browsing history, email address, and IP address, and transfer it to affiliate parties. Such details may further be used for affiliate marketing. Cookies that this search renders cannot be removed separately. The only way to get rid of them is to remove the hijacker completely. Although this particular browser hijacker affects Google Chrome most frequently, none of the other web browsers are immune to the attack. If your web browser's settings have been corrupted without your permission, your' immediate response should be a complete Search.freshtab.net removal. For this purpose, you can use Reimage. After that, don't forget to reset your web browser's settings. Search.freshtab.net is a redirect virus that changes new URL, start page and search engine without authorization to cause unwanted redirects later on. Redirects. The web browser is a target for hackers not without a purpose. The third-party search engine can display predetermined search results at the top of which people can find links to irrelevant or even unsafe domains. Advertising. Search.freshtab.net virus can also be accused of an excessive amount of ads within trusted websites. Malware can execute an extension on each web browser, which is set to generate commercial and non-commercial ads. Fake update pop-ups. Search.freshtab.net start page can contain ads that promote software or urge to install software updates. Be very careful with such ads because they may trick you into downloading more PUPs. Data collection. Although the question what information is personally identifiable and what is not is disputable, no one likes to reveal browsing history, name, email address, telephone number, bookmarks, and similar information to unknown parties, especially knowing the fact that it can be used for illegal purposes. Start page and search engine can be taken after the installation of any free application. Developers of potentially unwanted programs (PUPs) disseminate unwanted add-ons and extensions by bundling. Although this distribution strategy is not illegal, it's rather unfair because people are not explicitly informed how many programs are going to be installed on the system. “Free attachments” are typically revealed under Advanced installation wizard, but Quick or Basic installation setup is the default one. Consequently, if the user follows quick steps, he or she won't be informed about unwanted installers. Sometimes browser hijackers and other malware can be promoted via fake pop-up ads that inform PC's owner about missing/required updates or virus infection. It's not difficult to remove Search.freshtab.net from the system. The easiest way to get rid of it is to perform a thorough system scan with Reimage or another professional anti-malware tool. However, to remove malware from Control Panel (Windows) or System Libraries (Mac OS X) is not enough to remove Search.freshtab.net completely. You should also reset web browser's settings. This task has to be implemented manually, so you should follow the guide below. Also, it contains a section on how to get rid of Search.freshtab.net virus manually. Here, look for Search.freshtab.net or any other recently installed suspicious programs. Wait until you see Applications folder and look for Search.freshtab.net or any other suspicious programs on it. Now right click on every of such entries and select Move to Trash. When in the new window, check Delete personal settings and select Reset again to complete Search.freshtab.net removal. Once these steps are finished, Search.freshtab.net should be removed from your Microsoft Edge browser. 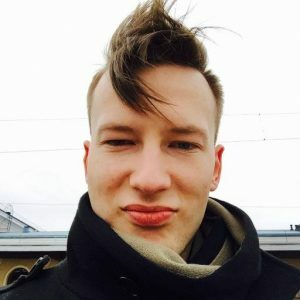 Here, select Search.freshtab.net and other questionable plugins. Click Remove to delete these entries. Now you will see Reset Firefox to its default state message with Reset Firefox button. Click this button for several times and complete Search.freshtab.net removal. Here, select Search.freshtab.net and other malicious plugins and select trash icon to delete these entries. Click Reset to confirm this action and complete Search.freshtab.net removal. Here, select Extensions and look for Search.freshtab.net or other suspicious entries. Click on the Uninstall button to get rid each of them. Here, look at the Homepage field. If it was altered by Search.freshtab.net, remove unwanted link and enter the one that you want to use for your searches. Remember to include the "http://" before typing in the address of the page. Now you will see a detailed dialog window filled with reset options. All of those options are usually checked, but you can specify which of them you want to reset. Click the Reset button to complete Search.freshtab.net removal process. ^ Margaret Rouse. Browser hijacker (browser hijacking). SearchSecurity. Free online information regarding cyber security . ^ Tim Dugan. Why You Rank On Google But Not On Bing And Yahoo (And How to Fix It). Search Engine People. One of the first digital marketing agencies in Canada. ^ Lee Mathews. Over A Million Coders Targeted By Chrome Extension Hack. Forbes. Online magazine. This entry was posted on 2018-02-22 at 01:56 and is filed under Stealing programs, Viruses. You can quickly scan the QR code with your mobile device and have Search.freshtab.net manual removal instructions right in your pocket. How did you remove Search.freshtab.net?